Rohiths will emerge from every house! Rohith Vemula did not commit suicide. It was a collectively committed institutional murder by BJP, ABVP and HCU administration. Therefore his murderers should immediately get arrested. By put forwarding this primary demand different progressive and democratic student organizations and social-political organizations are coming together and marching towards Vidhan Sabha from Byculla on first of February-2016. This has been declared in the press conference by Adv. Prakash Ambedkar and various representatives of progressive and democratic students. Various Ambedkarite, progressive and democratic organizations from Mumbai, Thane and Navi Mumbai have come together and formed a front called “Justice for Rohit – Joint Action Committee, Mumbai”. Students from IIT Bombay, Mumbai University, Tata Institute of Social Sciences, Tata Institute of Fundamental Research, Nirmala Nikethan college, Siddharth college, Govt Law college, Ruparel College, St. Xaviers college, International Institute of Population Sciences, Vivekanada college, Ambedkar College, and many others are part of the front. Martyr Rohit Vemula was a PhD student at the Center for Science, Technology and Society at the University of Hyderabad and also the former president of Ambedkar Students Association (ASA). Five active Dalit students were targeted and tortured continuously by ABVP and were able to bring about their suspension from the University with the help of University administration and Local MLA and central government. They were also socially boycotted by the University authorities. Against the castiest fascist goons, students of the University of Hyderabad are fighting continuously, this is not a fight between Dalits and non-Dalits, this is a fight between Vedic Hindu philosophy and the anti caste philosophy (Charvaka, Buddha and Dr.Ambedkar) which was going on since ages. In this fight Rohith Vemula was politically sensitive and vibrant who took a different path for his protest against the Brahmanical caste system. After this, a movement has emerged from all the democratic forces in the country. Joining with that, In Mumbai a front was formed called Justice for Rohit – Joint Action Committee, Mumbai. The JAC is going to conduct a rally on February 1st, Monday, 2016. We appeal all democratic and progressive people and organizations to participate in this march in large numbers. SC/ST atrocity case be booked on those who are responsible including the Vice Chancellor, the ABVP president, The BJP MLC and MHRD minister Smriti Irani and they be brought to justice. 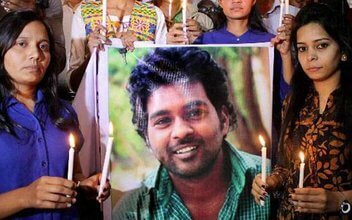 The Government and the university should financially support Rohith’s family. 8 yr old Jaunpur Child looses hand in caste atrocity.